The Busy Beaks' Sputnik is a fun toy from top to bottom. 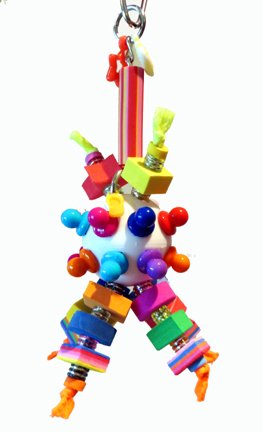 Hung from nickel plated, welded chain that is covered with a fun, chewable tube, the golf ball center is filled with bright, colorful pacifiers, chucky foam shapes and fancy chunky beads. There's a couple extra "charms" added for extra motion & texture. Topped with a nickel plated pear link on top for easy hanging, the Busy Beaks' Sputnik is sure to put a smile on your small to mid-sized parrot's beak!